Explore digital resources from the chemistry community, including lesson plans, activities, demonstrations, simulations, apps, videos, and more! This site provides teaching and learning tools to support green chemistry in the classroom. Formerly part of the Journal of Chemical Education website, ChemEdX provides a forum for teachers to exchange ideas and resources. This site contains resources created and accumulated by an experienced teacher. What is special about this site is the wealth of practice problems with answers. These simulations help students understand topics such as molecular modeling, solutions, reactions, and gas laws. The files are downloadable and can be used on any computer for free. Discovery Education provides free lesson plans written by teachers, for teachers. The site includes standards-based digital media that can be used to improve student achievement. Use the lessons as they are or modify them to create your own. Resources on this website will allow your students to explore the concept of isotopes. It contains explanations of key ideas, short assessments, and a comprehensive list of isotope related vocabulary. Several applets are available to calculate average atomic mass and mass spectrometry. Students can use the interactive, electronic version of the IUPAC Periodic Table of the Elements and Isotopes to discover what isotopes are and how they are used to calculate the average atomic mass of an element. Demonstrations provide a great way to get students interested in science and to visualize chemical concepts. They are important tools to be used in teaching and outreach. This website contains a library of demos that teachers can use with their students. Some activities have teacher resources included. Offers free safety guides, posters, videos and other resources to teachers. Scholarships are available for K-12 teachers to receive one- to three-day science safety courses at greatly reduced prices. A simulation without instructional support is difficult for students to use. An optimal way of using simulations is to embed them into curriculum materials. MW has an authoring system for teachers and curriculum developers to create or customize their own online lessons that use models and simulations. This website is designed as a service to and as a forum for collaboration of teachers that want to improve the quality of their chemistry classrooms. This website posts material on a variety of topics, and everything is downloadable and easily implemented. This site provides five units on nuclear-related subjects that teachers can use in the classroom. In some instances, the instructional units can be modified to be taught by teachers with varying degrees of knowledge in this subject area. POGIL (process-oriented guided-inquiry learning) is a student-centered learning strategy that guides students to construct new knowledge. Students work in small groups with roles to ensure that all students are fully engaged in the learning process. For free, PhET provides interactive simulations of physical phenomena. Students can make connections between real-life phenomena and the underlying science, deepening their understanding and appreciation of the physical world. Some simulations have teacher resources to accompany the activity. This site provides free 3D gamified virtual labs that are inquiry based. Science Friday is a trusted source for news and entertaining stories about science. It started as a radio show, created in 1991 by host and executive producer Ira Flatow. Since then, it has grown into much more: SciFri produces award-winning digital videos and publishes original web content covering everything from octopus camouflage to cooking on Mars. SciFri is brain fun, for curious people. These activities help teachers successfully implement standards-based inquiry instruction into their lessons. In addition to a host of free resources, Grand Valley State University also offers a 2.5 year program that assists teachers to develop an inquiry-based science classroom. Science teachers can earn a Master of Education with an Emphasis in Advanced Content Specialization or complete a 15-credit certificate program. This book is available to download for free with iBooks on your Mac or iPad, and with iTunes on your computer. Chemistry is supposed to be fun, you just have to know what to do with it. This resource can help you do just that. Chemical reactions don’t just happen; you have to make them happen. ChemCrafter lets you build your own lab to run fun and creative experiments. You must download the app onto an iPad. This is a product of the Chemical Heritage Foundation. University of Nottingham produces videos about each element on the periodic table. Each element page also includes links to additional resources about said element. Science is awesome. Sully Science uploads videos weekly with emphasis on chemistry and physics. These videos are mostly recording of lecture demonstrations that are performed in his class. Several videos feature students as they work on labs. A Regents chemistry teacher, Mark has shared his lectures of two levels of chemistry (accelerated/enriched and Regents chemistry). His YouTube channel also includes chemistry music videos that he’s created. Check out his website for more chem resources! These are recordings of Abigail’s AP Chemistry lectures during the 2013–14 school year. 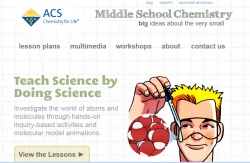 This online resource of lessons encourages students to investigate the world of atoms and molecules through hands-on inquiry-based activities and molecular model animations. The entire book is downloadable in PDF format. Teach the big ideas about energy in your chemistry class. Exercises, lab investigations, videos, and demos focus on the fundamentals of chemical, mechanical, nuclear, and gravitational energy. What causes certain substances to dissolve in water? Why do some liquids bead up on wax paper while others spread out? These questions and many more are explored in Inquiry in Action, a resource of guided activities that covers basic chemistry concepts along with the process of scientific investigation. This interactive website is a creation by the ACS Education Division and investigates everyday questions that kids have about topics from apples to zooming rockets. Featured on the website are an interactive game, a library of poems, experiments, videos, and other activities for students to experience. Use these activities to enrich the study of various science topics taught in elementary school. Topics are aligned with curriculum for physical science, earth and space science, and some life science. Best suited for grades 3-5. These inquiry-based activities are based on material from the ACS National Historic Chemical Landmarks program. The lessons, reading materials, videos, and student activities are designed as ready-to-go activities, easily implemented by a chemistry teacher or a substitute to supplement a unit of study. Reactions is a video series from the American Chemical Society that uncovers the chemistry of life. Topics covered include the chemistry of caffeine, ice cream, bacon, and other everyday items. In this video series, scientists tell their stories about how their childhood curiosity in everyday things helped them launch careers in the lab, win Nobel Prizes, and make other achievements. Their curiosity, mentors, role models, and other early childhood experiences may point to approaches that can be used today and tomorrow to encourage young people into careers in science, technology, engineering, and mathematics (STEM) fields. Spellbound was produced in 2011 for the International Year of Chemistry.